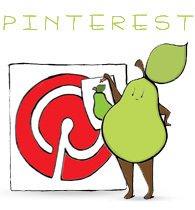 Categories: pear people | Tags: cookies, fruit, illustration, Pear, pear person, tea, tea time | Permalink. Now THAT’S a pear idea! Or a pear Halloween costume! Dalek pear! These pears always look sooooooo calm and innocent! I am suprised that there was not a little squabble during this tea time!! !